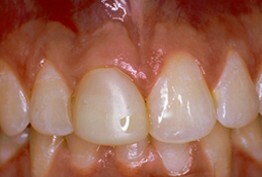 Before: Front (left) Central tooth has a poor restoration. Does not look natural and is not contoured properly to match the gumline of the rest of the teeth. 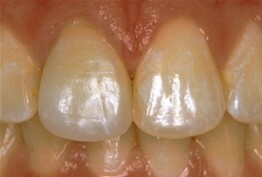 After: Replaced with an All Porcelain Crown (no metal). Tooth is now contoured to match the rest of the gumline. Restored tooth looks very natural and matches the shape and color of the patient's teeth. Before: Patient needs a Single Tooth Replacent of one Upper Central Incisor.